On November 7, 2018, in Siófok (Hungary), a representative of the Chamber of Commerce and Industry of Ukraine in Hungary, owner of East-West Mentor and Magasépítő'99 Kft., The exequatur for the appointment of the Honorary Consul of Ukraine was officially presented in Siófok (Hungary) , with the participation of representatives of the Embassy of Ukraine in Hungary and representatives of the Ministry of Foreign Affairs of Hungary. 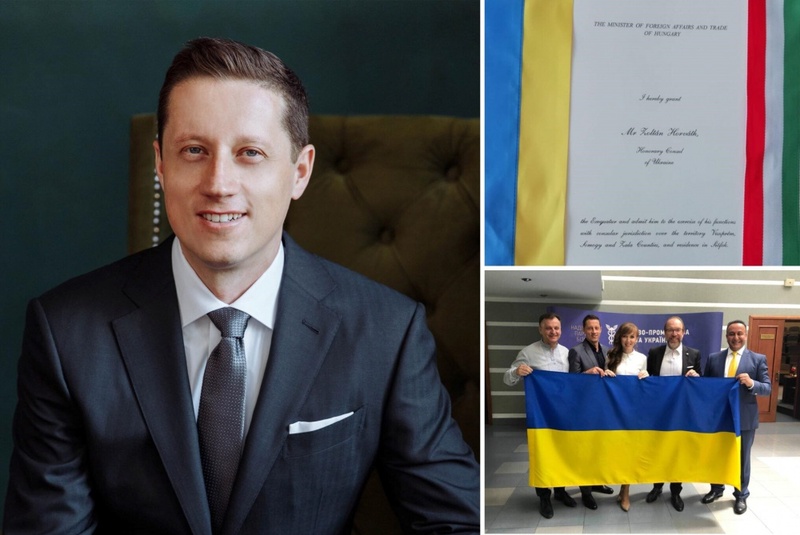 The Hungarian businessman with Ukrainian roots Zoltan Horvath has supported and organized many international social projects and initiatives on establishing friendship and cooperation between Ukraine and Hungary over the last three years. In particular, in the city of Volnovaha (Donetsk region) last year, presented a large playground, and this year brought a whole computer class and opened, together with children, teachers Volonavskaya secondary school №6 and people's deputy of Ukraine Dmitry Lubinz -European Center for the Study foreign languages, which aims to help children learn English and Hungarian, as well as establish communication between children of Volnovaha and Shiofok. Also, Mr. Zoltan acted as co-organizer and partner of international social projects: "Children ask for peace", "Children's football for peace", the main goal of which was to consolidate the world around the world, promote healthy lifestyles, establish cooperation and friendship between children of Ukraine and European countries and which were implemented in 19 countries of the world and gave the opportunity to more than 500 Ukrainian children from low-income families to see the world, find new friends and learn the culture and traditions of other countries. Mr. Horvat pays considerable attention to the establishment of business relations between Ukraine and Hungary, which is why, since April 2018, Zoltan Horvat is an official representative of TPPU in Hungary, supports various business forums, conferences and round tables in Ukraine and Hungary, organizes meetings with businessmen, bankers, investors, and recently opened a Ukrainian-Hungarian consulting company "East West Mentor UA", headed by Anna Krisjuk, in Kyiv. According to Mr. Zoltan's partner in Ukraine and director of the East West Mentor UA Anna Krisjuk, Mr. Zoltan is doing a lot for establishing friendly and business relations between Ukraine and Hungary, and indeed for all of us we have an example for imitation, because his sincerity, decency and the desire to find the cities of peace and cooperation between our countries convinces everyone, that is the future of great friendship and cooperation between Ukraine and Hungary. We sincerely thank him for the significant contribution and assistance Mr. Zoltan makes to Ukraine today, for the Ukrainian children from the Donbas where there is a war, for supporting the rehabilitation and treatment of our military and also the weighty authorities in promoting Ukrainian goods to the Hungarian market.